Although a book is born of many impulses, and influenced by diverse experiences, authors often speak of a symbolic moment of conception--an "aha" moment when you say to yourself, "I have to tell this story." That moment came for me several summers ago, in the faculty dining room at Omega Institute, the education and retreat center I cofounded in 1977. Over the years I have shared countless meals with conference and workshop leaders in that room, moderating discussions between medical doctors and shamanic healers, Christian monks and Jewish rabbis, Zen teachers and business executives. On this particular day I was eating lunch with Babatunde Olatunji, the West African drum master and world-music innovator. Seated next to Baba was the American poet Allen Ginsberg, engaged in conversation with Gelek Rinpoche, a Tibetan Buddhist lama, and Joseph Shabalala, a South African musician and freedom fighter. They were talking about their twin passions--politics and spirituality--and how challenging it was to combine the two. At the other end of the table was the onetime heavyweight champion of the world Floyd Patterson picking over his plate of tofu salad and discussing his workshop, "The Tao of Boxing," with a Chinese tai chi master, a tiny woman dressed in black pajamas. Next to them sat Huston Smith, the renowned authority on the history of religions, chatting with Ysaye Barnwell of the gospel group Sweet Honey in the Rock, and John Mohawk, a Seneca author and spiritual leader. Catching bits and pieces of conversations, I turned to Baba Olatunji and asked, "So, what do you make of this--all these traditions meeting and merging?" Baba leaned back in his chair and surveyed the scene. Then, waving his fork at the extraordinary cast of characters seated around us, he announced, "This is a new kind of spirituality. It's American, and one day it will be the world." An American spirituality--I liked that concept. It described my own spiritual life, something I had never been able to label. I had been actively searching for God since childhood. My path wove through the peaks and valleys of many different traditions: organized religion, disorganized mysticism, psychotherapy, philosophy, mythology, science. My search had all the signs of being an American one: it was open-minded, individualistic, and adventurous. It celebrated diversity: ten years of discipleship with an Eastern meditation master; a deep immersion into Christian, Jewish, and Islamic mysticism; extended work with a psychotherapist; study of Jungian psychology and Western schools of philosophy; and exposure, from my work at Omega Institute, to a range of healing systems, from ancient Chinese medicine to modern consciousness research. For more than twenty-five years I had been on an adventure, searching for a genuine and fearless kind of spirituality. My goal had not been to become a Christian or a Jew or a Muslim; a Buddhist or a Sikh or a Hindu. I didn't want to become anything other than my most vibrant, peaceful, and grateful self. I wanted to find a sacred path through the fullness of life in the real world--a daily discipline that reached into the heavens even as it dug deeply into my psyche, helping me overcome resistance, falseness, and mistrust. On such an adventure I would need to seek guidance freely, from the rich repository of the world's wisdom traditions. Baba Ola-tunji's words about an "American spirituality" rang true: what I was seeking was a spirituality as diverse, democratic, and individualistic as America itself. After my "aha" moment in the lunchroom with Baba Olatunji, I set out to research and write about the emerging American spiritual tradition. I had three distinct yet related stories to tell: America's story, my story, and yours--the reader's story. America's story, because each American's spiritual quest is fundamentally marked--for better and worse--by American values. My story, because a book about the spiritual journey is about an individual's most basic questions: Who am I? How should I live? What happens when I die? Without honest, real-life examples to accompany theories and practices, spiritual literature lacks veracity. Since the real-life examples I am most familiar with are my own, I have structured this book around my spiritual adventures--my blunders and my accomplishments, my dark nights and my luminous awakenings. But in writing about my path, I did not want to betray the most important message of the book, which is that each person's spiritual journey is different, worthy, and unique. Therefore, the third story in the book belongs to the reader. Directions on the spiritual path are offered here; it is my hope that you will use them to chart a course all your own. 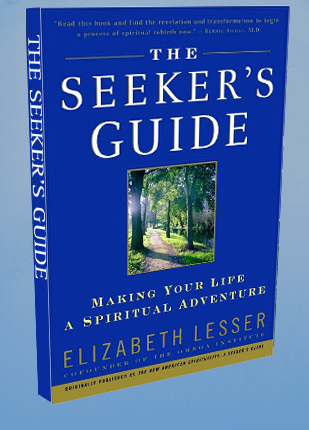 Excerpted from The Seeker's Guide by Elizabeth Lesser Cofounder of the Omega Institute Copyright © 2000 by Elizabeth Lesser Cofounder of the Omega Institute. Excerpted by permission of Villard, a division of Random House LLC. All rights reserved. No part of this excerpt may be reproduced or reprinted without permission in writing from the publisher.